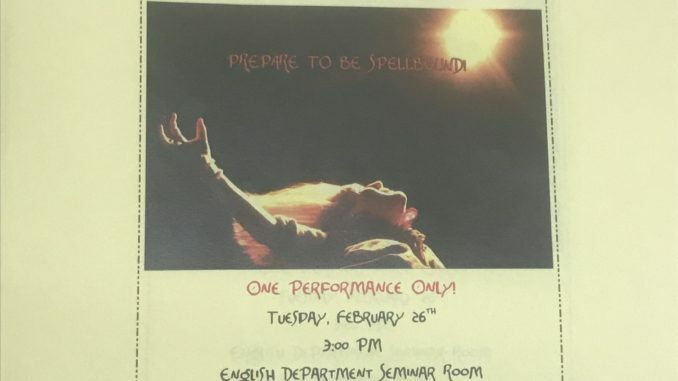 On Tuesday Feb 26, between 3 and 5 pm, the St. John’s English seminar room will feature regicide, madness, and Great Birnam Wood coming to high Dunsinane Hill. Come join us! The Dzieci Theatre Company will present their three-person “Makbet” (Macbeth) to those lucky enough to fit inside the narrow confines of our seminar. If you’d like to come, send me an email — mentzs@stjohns.edu — and I’ll hold a seat for you. Note to denizens of the English department hallway in St John Hall: we apologize in advance for any noise or disruption on the afternoon of the 26th. It won’t be the easiest place to hold office hours or do homework for a few hours that afternoon. Come inside instead for the most intense theatrical experience you’re likely to have this year!